OFF SEASON (Sept to May) Nightly rate is $350 per night. Summer rates are higher. Weekly rental during the summer months: Saturday to Saturday ONLY. The nightly rate does NOT include tax, cleaning, reservation fee or damage waiver. The rate of $350pn is for the 'off season' which is September to May only. Summer rates listed below and on my website. I DO NOT list my Surf Rider Condo on Craigslist. There have been many vacation rental scams on CL recently. If you see a Surf Rider condo listed on CL and the nightly rate seems too good to be true, then it probably is. Each Surf Rider Condo is individually owned and managed. I only own and manage this listing within the Surf Rider Condo complex. This upstairs middle unit, ocean front condo is totally TOP OF THE LINE!! Luxuries include a Jacuzzi, large plasma screen TV with a DVD player, vaulted ceilings, fireplace, slate flooring throughout, granite counter tops in kitchen, travertine in both bathrooms, top of the line stainless steel appliances,dishwasher, and a front loading washer and dryer in the condo. The interior offers breathtaking views from the living room, as well as from the pillow-top ultra comfy bed in the master bedroom where you can sit in bed and enjoy the waves, dolphins and surfers. There are also ocean views from the second bedroom which has its own private entrance. The Surf Rider ocean front condo will sleep 4 adults in two queen beds. The sofa in the living room will make into a double bed for extra sleeping space. This condo is UPSTAIRS on the 2nd floor, the second unit in from the boardwalk with amazing ocean views and has a private patio with seating which is located outside, directly in front of the interior dining area. (Photo shows the 6' sliding glass door and a 7' unobstructed window facing the ocean, this is where the condo's reserved patio area is located.) 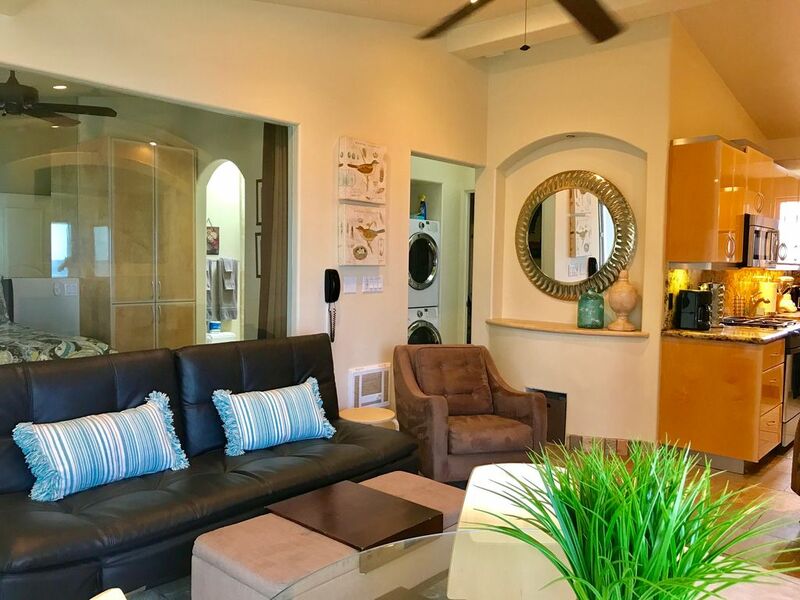 In addition to the private patio area for our condo, there is also a large common (shared) patio downstairs surrounding the Jacuzzi and BBQ area complete with chairs and chaise lounges for your use. We have stocked the property with all the cooking utensils you could ask for... lots of pots & pans, knives, hand mixer, the VERY important blender for making margaritas, wine glasses, wine opener, plastic tumblers to take to the beach, beach chairs, beach towels, serving dishes and utensils, BBQ tools too...it's all here for your use and enjoyment. Don't miss your chance!! Reserve your week in this deluxe Surf Rider Ocean Front Condo today. PLEASE NOTE: The owner does not guarantee that the Jacuzzi will be available or operational. Jacuzzi could be closed for service or not working. Although we hope that any such interruptions would be brief, owner is not responsible for the availability of the Jacuzzi during your stay. No Parties allowed on property. Partying may result in immediate removal from property without refund. The entire Surf Rider Condo complex is a non smoking property. Welcome to the Surf Rider! I absolutely love living near the coast and know that your trip to our area will be a wonderful time, there is so much to see and do in Sunny San Diego! My name is Heather and I will be the one you have the most contact with. I have been managing vacation rental properties for the past 15 years and for 8 of those years I have owned and operated two seperate boutique vacation rental company in Mission Beach, not far from La Jolla where we now live. Please feel free to email with any questions about our properties listed here on VRBO! I'm happy to help. San Diego is our home, we love it here and know that you will too! The Surf Rider holds a special place in our hearts as our family has many memories of playing on the beach and watching sunsets. toilet, shower, Shower only in each bathroom. No Tub. 2 bathrooms. Each bathroom has a standing shower only, no tub. The Surf Rider condo is located on the ocean front in Mission Beach. You can't get closer to the beach than this! additional linens provided, beach towels too! There is usually some spices along with oil, baggies, foil, dishwasher detergent, etc in the condo. There is a common patio downstairs and there is also a private patio that belongs to our condo just outside the front door. Internet access, built in gas BBQ grill on common patio, Jacuzzi, all linens provided, Washer/Dryer, Hair dryer, DVD/CD. Had a great time...Great location. Doors and locks seemed difficult to engage and ensure they were secured. Thank You Heather!!! Thank you for your review. I am glad you had a fun girls trip at the Surf Rider and the weather cooperated for you. The front door has a european door lock and handle which is not what we are generally used to, here in the states. I have detailed instructions inside the unit, on the wall, just to the left of the front door about how to make sure the door is locked/secured. I hope you were able to utilize the instructions during your stay. The apartment was great for 2 couples, but being 20 feet from the beach really made it special. We had a wonderful vacation with our two teenagers in San Diego. The Surf Rider condo was the perfect location for beach access, people watching from the hot tub, sunsets, and all activities and restaurants. Kids would hope on a scooter or bike and explore on their own. The condo had everything we needed to make meals and enjoyed using the grill. Only downside was the lack of internet access. The owners were quick to help but we still couldn’t get it working. Didn’t ruin our fun and we look forward to our next trip to San Diego. Very clean and well maintained! Great property. Very clean and had all the essentials we needed for the week. Can’t find a better condo on the beach. Heather was extremely quick to respond with any questions we had and easy to work with. Can’t wait to come back. Very clean, comfortable, and convenient. Thoroughly enjoyed our long weekend. Perfect location. We love this place! Great location at the Surf Rider which is close to everything. Heather was great and let us check in early. We had an issue with the hot tub the first night so I contacted Heather. The next morning there was someone there at 9am. I do not allow for cancellations and do not offer refunds should you have to cancel your stay after you reserve. I will do my best to work with you and try to get the condo re-rented should you have a change of plans. If I need to discount the rental rate of the condo in order to re-rent it for the same time frame you had rented, you will lose the amount of the discount as well as a $150 cancellation fee. If the condo does not re-rent for the time frame you canceled you will lose the entire cost of the reservation and not receive a refund. If you think you may have to cancel your stay I suggest you either wait to book my condo until you are sure, or purchase travel insurance. Make sure to read the TI policy so you know what IS and IS NOT covered. You can purchase it through any TI site you wish. I cannot insure against the reasons you may need to cancel, but you can by purchasing travel insurance. We are not a hotel and cannot immediately replace a cancelation with a new reservation. Once we have a reservation, it means that we lose all of the other potential reservations that may have wanted to rent the same time period. This is why we cannot accept cancelations. Thank you for your understanding.